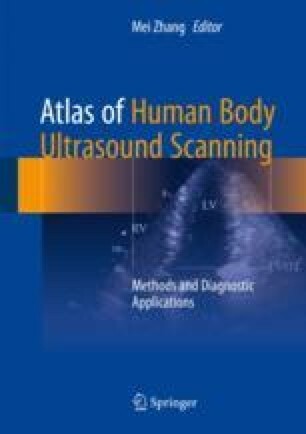 In this chapter, thyroid scanning is introduced, including scanning method, measurement and normal value, and clinical applications. The patients are usually placed in the supine position with the mild hyperextension of neck. The probe is placed at the throat, scanning the both lobes in the transverse and longitudinal planes. In addition, the blood distribution in the thyroid parenchyma should be assessed on color Doppler. The peak systolic velocity of the superior and inferior thyroid artery is acquired on spectral Doppler.